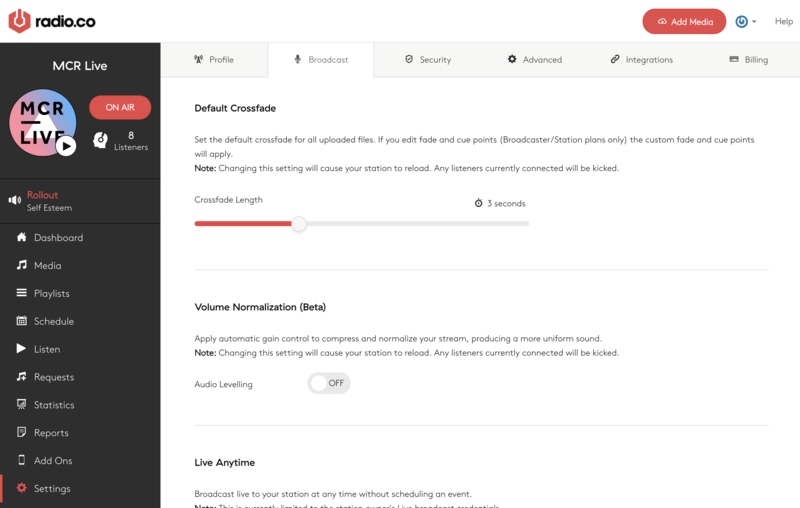 A brief overview of all settings options in Radio.co. Name: This is to identify the station within Radio.co. It will also be included in any players such as iTunes or VLC. Logo: This is used as the default image on our web players if your track artwork is not available. It is also shown on the dashboard. The image should be 500x500px PNG. This information is used for future directory integration and is self-explanatory. Timezone: This is the primary time zone of your station. This should be set to the time zone your station is primarily located. Changing this setting will affect the schedule. You can adjust the crossfade between tracks. If you have manually set cue and fade points using 'Track Editor' this value will not apply. Note: If you have a top of hour playlist scheduled, your station will cut to the new show on the hour. This setting does not affect the transition between a Live Broadcast and automated tracks. Click Save to update this field. This does not require a reload and will be effective from the next played track. Give your station a more uniform sound. Please note, this is a beta feature and may cause stability issues with your station when using M4A files. We only recommend using this function with MP3 files. The station owner user can connect and broadcast live via Radio.co without needing to schedule a live event. Sound Quality: Default is 128Kbps and is suitable for most applications. If your listeners are in an area with poor connectivity you may wish to lower this to 64Kbps or 96Kbps. For the best quality stream set this to 192Kbps. Note: A higher bitrate will consume your plan's bandwidth faster. Output Format: Default is MP3 as this is widely compatible across devices. AAC is supported and sounds better at lower bitrates, however, it may not be compatible with Web Players in certain browsers. Mobile Streaming: This enables a second lower quality 16-64Kbps AAC stream which is suitable for Mobile devices accessing from a cellular connection. If you use the included Web player and set it's stream to Adaptive the mobile stream will be used on mobile phones and tablets. Click Save to update these settings. Be mindful that any changes here require a station reload which will kick all your listeners. These settings should not be adjusted during peak shows. If you only wish to block access to a select few territories select Block then add them to the countries list. However, if you just want to give access to a few territories then select Allow and add them. You can find your FTP details on this page. If you have provided your FTP details to someone else and no longer want them to have access, you can change the FTP password by clicking Generate. Note: We suggest saving your FTP details in your software. Turn requests on or off and edit your request policy. 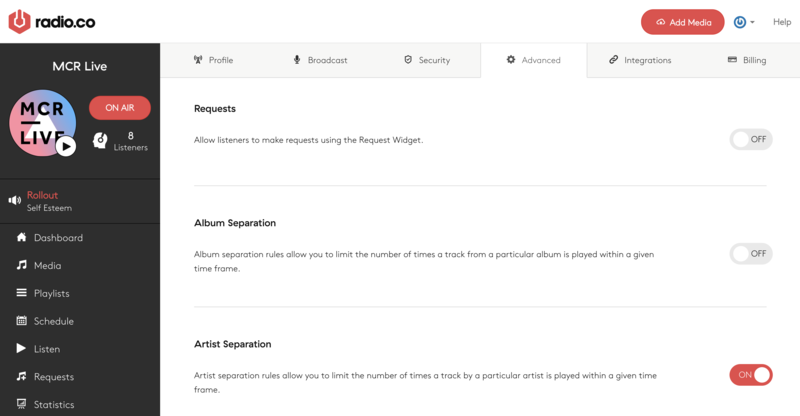 Prevent certain artists or albums from playing for a defined time. Note: Incorrect settings here may cause your station to fall silent. Please ensure your tracks are tagged and named correctly before using this feature. 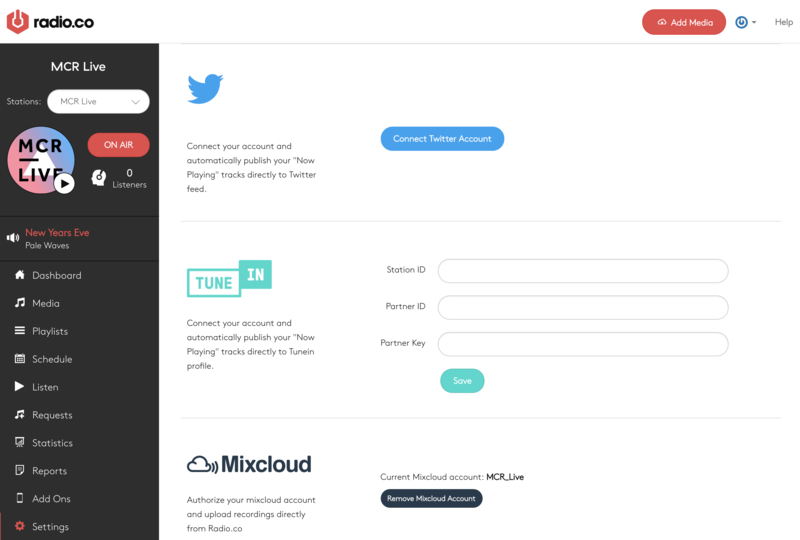 You can add your TuneIn API information, Connect Mixcloud or enable Twitter from this page. Please refer to specific guides in the Support Centre for these services.